Rangers manager Steven Gerrard is a happy man. Speaking to Rangers TV he said: "I was pretty confident we were going to get a reaction tonight as the players were frustrated about the weekend's showing. We started well and Kilmarnock going down to 10 men helped us even more." On Alfredo Morelos: "He deserved his four goals, he was a constant threat throughout the game. He showed again we've missed him sorely in certain games this year. "I'd also like to praise the support cast tonight, Candeias getting assists, Ryan Kent getting an assist. We were well in control before the referee took one of their men away." Quote Message: It’s really hard to evaluate the whole Rangers performance tonight because of the early red card. Especially to a goalkeeper because then it’s another substitution, another re-shuffle of the opposition. What you have to complement them on is their ruthless streak tonight. They didn’t look back, they were just relentless in trying to get more goals. It’s really hard to evaluate the whole Rangers performance tonight because of the early red card. Especially to a goalkeeper because then it’s another substitution, another re-shuffle of the opposition. What you have to complement them on is their ruthless streak tonight. They didn’t look back, they were just relentless in trying to get more goals. Quote Message: It was a pressure game, a game that had to be won. Everybody knew that or else there was going to be a lot of stick coming Steven Gerrard’s way, the club’s way. Kilmarnock were tired physically and mentally and Rangers destroyed them. It was a pressure game, a game that had to be won. Everybody knew that or else there was going to be a lot of stick coming Steven Gerrard’s way, the club’s way. Kilmarnock were tired physically and mentally and Rangers destroyed them. After tonight's haul of four goals, Alfredo Morelos has now scored eight in total against Kilmarnock this season- that's more than any other team has managed against them. Lethal. Not had enough football for the night? Sportscene will be with you at 00:45 on BBC One Scotland with the highlights of tonight's match, plus last night's cracking tie between Highland rivals Inverness and Ross County. For those of you heading to bed, you can catch up on iPlayer from tomorrow. With the game goalless, Kilmarnock's Eamonn Brophy felt he should have had a penalty after a challenge from Joe Worrall, before Alfredo Morelos tapped in the opener. Daniel Bachmann was then sent-off in controversial circumstances after his arm connected with Glen Kamara and from then on Rangers cranked up the pressure. Morelos fired in number two before the break and added the fourth and fifth after it, Daniel Candeias at the heart of three of the four with superb assists. Andy Halliday slammed in the third minutes after coming off the bench. All in all, a brilliant night for Rangers. Quote Message: You're looking at a striker that can score different types of goals. He scored a right foot shot, a left foot shot, a header getting in at the back post showing great positional sense. You've go to look at that and think he's got a lot to offer. You're looking at a striker that can score different types of goals. He scored a right foot shot, a left foot shot, a header getting in at the back post showing great positional sense. You've go to look at that and think he's got a lot to offer. Jack and Kamara now midfield pair? Quote Message: I thought Ryan Jack and Glen Kamara were brilliant tonight. They complemented each other and I feel like they will be regulars together now. I thought Ryan Jack and Glen Kamara were brilliant tonight. They complemented each other and I feel like they will be regulars together now. Quote Message: He's got everything for me as a centre forward. He can play on his own although I'm not sure how much he enjoys playing with a partner. Certainly when he's alone or operating with two wide men, he enjoys it. He's so powerful. Although he's not a big man he's got a good leap on him. He's got everything for me as a centre forward. He can play on his own although I'm not sure how much he enjoys playing with a partner. Certainly when he's alone or operating with two wide men, he enjoys it. He's so powerful. Although he's not a big man he's got a good leap on him. Some cracking ties to look forward to next month as Rangers complete the Scottish Cup quarter-final line up. They'll travel to Pittodrie to face Aberdeen, where they won 4-2 a fortnight ago. A superb display from Rangers, who cruise through to the quarter-finals, where they'll play Aberdeen. 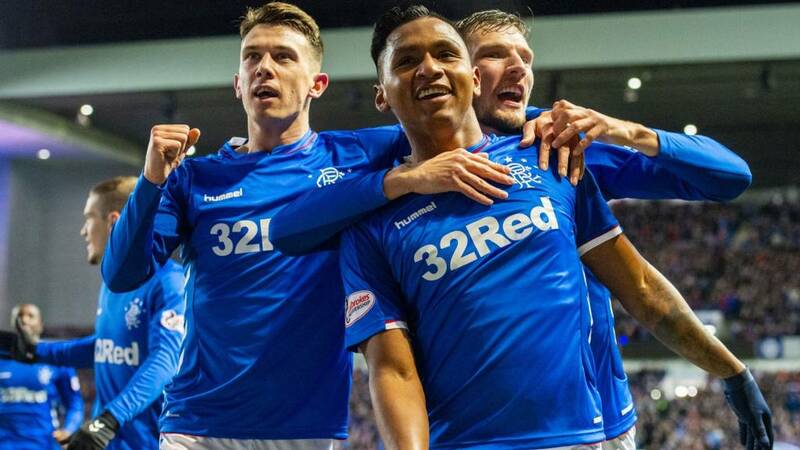 Alfredo Morelos, on his return from a ban, slammed in four goals to take his tally for the season to 27 goals in all competitions. Daniel Candeias assisted three of them in a scintillating display. Andy Halliday grabbed the other off the bench. Kilmarnock remember were reduced to ten men early on at 1-0 when goalkeeper Daniel Bachmann was controversially sent off for an elbow on Glen Kamara. They felt they should have had a penalty at 0-0 too when Joe Worrall appeared to pull Eamonn Brophy. In the end though, it was a comfortable night for Rangers, who charge on in the Scottish Cup. Kyle Lafferty's touch evades him as he sneaks in behind the Kilmarnock defence. Substitute Lafferty thought he'd got in on the act there. He runs on to an Andy Halliday cross and finishes well from close range. But the flag is up for offside. Rangers are coasting to the quarter-finals and want more goals here. It's desperate stuff for Kilmarnock. It's four for Morelos! He has been unplayable tonight. The defending from Kilmarnock here is generous to say the least. Steven Davis robs Youssuf Mulumbu on the edge of his own box, it falls to Morelos who ruthlessly dispatches the ball into the net. And there's the hat-trick! Alfredo Morelos slams in a 26th goal of the season after another incisive pass from Daniel Candeias. The Portuguese winger has assisted all three of Morelos' goals tonight. Outstanding stuff. And that will be that! Practically Andy Halliday's first touch off the bench is to slam the ball into the top corner from just inside the box after Ryan Kent's cut back. Kilmarnock manager Steve Clarke looks pensive on the touchline. I wonder what his reaction will be to some of the decisions in this match? Andy Halliday is also on at left-back for Rangers in place of Borna Barisic.